Pull a Gooseneck Trailer with a 5th Wheel Hitch! Convert Your Gooseneck Trailer to a 5th Wheel Trailer! 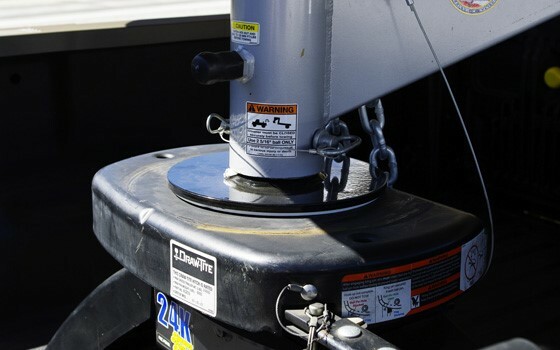 Now you can tow your gooseneck trailer with your Semi-Tractor or pickup truck 5th wheel hitch, simply by removing your gooseneck trailer coupler and replacing it with a gooseneck trailer stem with a 10 inch round bolster plate and a S.A.E. standard kingpin (same kingpin that is used on 5th wheel RV’s and semi-tractors). The Trailer stems are 18 inches long and have adjusting holes to change trailer tongue height. These hitches are 30,000 pound GVW for straight models, and 24,000 GVW for extended models, in a powder coated black. Be on your way quickly with easy installation! 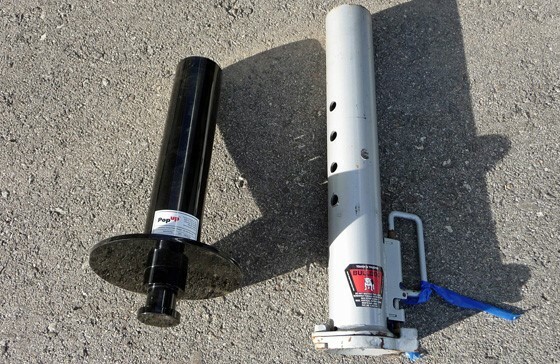 Models are available with 9 inches of extension to give you more clearance between your tow vehicle and trailer to give you more tailgate and trailer noise clearance, plus additional trailer swing radius, and are available for 4 inch round, 4-1/2 inch Square, & 4 inch square trailer stems. GN6 Gooseneck to 5th wheel hitch converter with a 4-1/2 inch square trailer stem. SB5 Gooseneck to 5th wheel off-set adapter with 9 inch extension and a 4 inch round trailer stem.